Surveying is one of the oldest professions. Traditionally land surveyors are professionals who determine or establish points, lines, polygons of the selected real word objects, who collect their attribute data, who register the rights on those and visualize the results. To fulfil the needs of the society usually surveying schools were one of the first higher educational institutions in the field of engineering in every country. On the one hand, to process raw measurements a very high level of mathematical background was needed. That is why so many mathematicians are in close contacts with surveying. On the other hand data processing needed special devices like the abacus, the logarithmic table, the mechanical calculator etc. At the middle of the last century a new device was introduced: the computer. It changed dramatically first our computational habits in sixties, and afterwards the mapping devices and the data processing practice as a whole new way of thinking. In the seventies the remote sensing satellites and in the eighties the Global Positioning System (GPS) generated more basic changes. The introduction of Internet and the rapid changes of Information and Communication Technologies (ICT) caused yet another fundamental transformation of surveying. Nowadays the computers are used only for a very little percentage for computing. They are totally integrated into our workflow, serving us within data acquisition, database developments, data processing, data analysis and visualization. Through the computer networks our profession serves the e-Society. In the last fifty years computers have changed the work of surveyors totally. As usual the way of thinking is always a little bit behind the possibilities. The aim of this publication is to summarize the results of FIG Commission 2 on the field of computer uses in surveying education, to help academy and surveying industry to more quickly make the transformation from traditional teaching and learning to e-learning. This publication aims to support FIG community with basic knowledge on e-learning and declares the FIG policy in this field. The content is a summary of lessons learned in e-learning during the last FIG events, basically at the workshop in Enschede, June 2008. We would like to thank for all the contributors of this publication, but pre-eminently Prof. Steven Frank, Dr. Reinfried Mansberger, Dr. Adrijana Car, Dr. James Petch and Nicholas Frunzi. Developments in ICT had a huge effect on the surveying profession (Markus, 2008). New technologies and new opportunities have enabled surveyors to broaden their skills and competencies. The number of competencies in which surveyors might claim to be proficient now number over 200 (Mahoney et al, 2007). The rapid changes in the profession have created a growing need for continuous changes in education and an increasing demand for continuing professional development (Markus, 2008). ICT and the impact on the surveying profession and professional education. lifelong learning, versus vocational training. Fairly (2009), advocating a clear, concise surveying profile for the future, distinguished two major changes taking place across Australia and the EU: internationalization and interoperability. Surveyors of today work in an increasingly global market and the profession has grown rapidly beyond cadastral surveying, with increasing application of surveying and mapping technologies in other sectors. Lifelong learning has become a buzz-word and a well established concept for continuous professional development of staff engaged in surveying institutions and other land professionals (Osskó, 2008). E-learning methods and tools have been introduced and are now playing an increasing role in professional education. E-learning is one of the main themes in FIG Commission 2 – Professional Education (Markus, 2008). Several FIG events in the past years were dedicated to e-learning or related topics such as curriculum design, knowledge management, and management of education. This technical report summarizes the outcomes of the Commission’s workshops, symposia and working groups. The report aims to bring together the experiences and viewpoints within FIG on the role of e-learning in surveying education. The intention of the report is to support FIG members and their affiliates and the surveying public in general in their efforts to further develop e-learning initiatives within their organisations. The steps for taking a data model through its conceptual, logical, and physical phases, including modelling the user’s view, defining objects and relationships, selecting geo-graphic representations, matching geo-database elements, and organizing the geodatabase structure are used as guidelines for building the structure of this publication. The report will start in chapter 1 with a general explanation of the concept of e-learning; this is followed by a more in-depth description on the nature of e-learning in chapter 2. In chapter 3, e-learning technology and infrastructure, the more practical aspects of e-learning are covered, with in chapter 4 a discussion on effective e-learning. Chapter 5 is dedicated to role of e-learning in surveying and in chapter 6 the FIG policy on e-learning is presented. Many issues presented in these chapters come back in the two examples of best practices in e-learning in surveying at the end of the publication: Case of Best Practice 1, UNIGIS, and Case of Best Practice 2, ESRI. 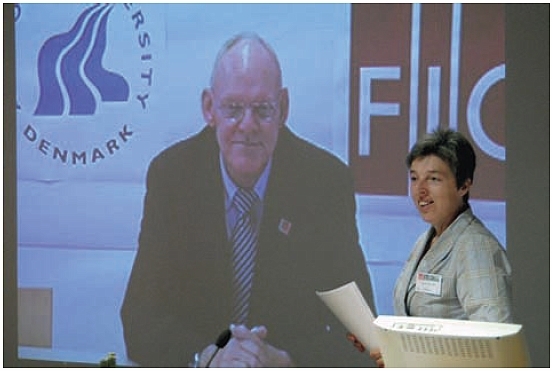 FIG President Stig Enemark delivering his opening speech from a distance by using Video Conferencing (FIG Workshop Sharing Good Practices, Enschede, the Netherlands, June 2008). In the front Liza Groenendijk, editor of this publication. © ITC. e-learning as pedagogy for student-centred and collaborative learning. These aspects in fact summarise the development of e-learning in time. Early developments in e-learning focussed on computer assisted learning, where part or all of the learning content is delivered digitally. More recently the pedagogical dimension of e-learning has become prominent. E-learning has become popular because of its potential for providing more flexible access to content and instruction at any time, from any place (Means et al, 2009). enabling instructors to handle more students while maintaining learning outcome quality that is equivalent to that of comparable face-to-face instruction. If student outcomes are the same whether a course is taken online or face-to-face, then online instruction can be used cost-effectively in settings where too few students are situated in a particular geographic locale to warrant an on-site instructor (e.g., rural students, students in specialized courses). The potential role of e-learning in Continuing Professional Development was already mentioned in the FIG Policy Statement on CPD published in 1996. And the experiences within Commission 2 has shown that this was not just a nice policy idea at that time, but that e-learning has proven to fit perfectly with the concepts of life-long-learning or continuing development. It has proven to be a flexible mode of learning for professionals. Due to the high flexibility in time-, site- and learning aspects, e-learning is a proper tool and an essential driving force for the realisation of life-long learning. E-learning in surveying: anywhere, any time and any one. Student Working on an assignment for his distance course at 300 km/hr in a bullet train in Japan (top) and students in Ghana participating in an online course with local facilitation (bottom). In the dynamically changing world of business, the competitiveness of companies (and/ or universities) depends heavily on the possibility to find, for a given problem, the right knowledge in the right moment. By using a Knowledge Management System (KMS), organisations increase returns, save time and money, are more adaptable, and have a far better understanding of partners, processes, customers, competitors and their business. To benefit from every customer or partner interaction, corporations must give employees the opportunities to record what was learned. Efficient knowledge management needs not only document knowledge but must provide tools for collaboration among all contributors to the knowledge pool. Then, other employees must have access to the data and the means to understand it in context. Knowledge management helps an organisation gain insight and understanding from its own experiences. When employees use KMS, best practices are stored throughout the organization, and each employee accessing the system has similar power to the best employee (Markus, 2002). Daily tasks are evolving faster than universities can produce qualified graduates. Many employers apply constant, on-the-job training to remain competitive. E-learning programs help staff members to obtain new skills and critical improvements quickly and efficiently. Companies integrate e-learning into the mainstream. They can easily amalgamate learning modules into staff communications, and can add similar tools to web-based systems. E-learning opens the world. Likewise, small businesses can access the same level of knowledge and insight that was earlier only available to large companies. Mobile technology helps e-learning initiatives. Wireless technology allows educators to reach learners in their working environment. The ESRI Case (see the appendix) gives an excellent insight in the role and development of e-learning to support workplace learning. pro-active learning, i.e. organizational changes that have been made on a more intentional basis. Adaptive learning is seen as a process of incremental changes, more automatic and less cognitively induced than proactive learning. Proactive learning which goes beyond the simple reacting to environmental changes. Early developments in e-learning focussed on computer assisted learning, where part or all of the learning content is delivered digitally. These type of e-learning activities can be classified according to its objective – whether the activity serves as a replacement for face-to-face instruction (e.g., a virtual course) or as an enhancement of the face-to-face learning experience (i.e., online learning activities that are part of a course given face-to-face) (US Department of Education, 2009; Verkroost, 2009). More recently the pedagogical dimension of e-learning has become prominent. Learning experiences can be classified in terms of the amount of control that the student has over the content and nature of the learning activity. In traditional or expository learning experiences, content is transmitted to the student by a lecture, written material, or other mechanisms. Such conventional instruction is often contrasted with active learning in which the student has control of what and how he or she learns. Another category of learning experiences stresses collaborative or interactive learning activity in which the nature of the learning content is emergent as learners interact with one another and with a teacher or other knowledge sources. Typically, in expository instruction, the technology delivers the content. In active learning, the technology allows students to control digital artefacts to explore information or address problems. In interactive learning or collaborative learning, technology mediates human interaction either synchronously or asynchronously; learning emerges through interactions with other students and the technology (US Department of Education, 2009). Both active and interactive learning approaches are student-centred and make use of online learning models supported by Web 2.0 technologies. Blended learning combines e-learning with face-to-face learning and other learning mechanisms. It can include the use of audio, video, documents, software, and "hands-on” experiences. Blended learning recognizes that some learning experiences are not appropriate to e-learning and need be taught in other fashion. For example, learning how to measure angles with a theodolite is greatly enhanced by physically operating the theodolite in practice – setting the instrument precisely over a point and precisely pointing the instrument at various objects to be measured. (Lam 2008). One of the great advantages of digital medium is the ease of storage and reusability of teaching materials or “learning objects.” Keeping learning objects on file is done with a push of a button. Upgrading and redeveloping materials is simple and easy. To be reusable, e-learning objects should be easily disassembled and reassembled. Users should be able to easily mix materials from multiple sources without dependence on proprietary systems (Hodgins and Conner 2000). Learning objects are a new way of thinking about learning content. Traditionally, content comes in a several hour chunk. Learning objects are much smaller units of learning, typically ranging from 2 minutes to 15 minutes. Are self-contained – each learning object can be taken independently. Are reusable – a single learning object may be used in multiple contexts for multiple purposes. Can be aggregated – learning objects can be grouped into larger collections of content, including traditional course structures. Are tagged with metadata – every learning object has descriptive information allowing it to be easily found by a search. There is general trend from long to short in building learning objects. Nano learning (n-learning) is the latest term in the natural progression: from learning, distance learning (d-learning), flexible learning (f-learning), electronic learning (e-learning), blended learning (b-learning), and the recent addition, (mobile) m-learning. Metadata is data about data and the time of production. It describes the content of data, the data producer, and the purpose(s) for which the data was produced. Typical e-learning metadata allows the potential user (instructor or student) to assess the quality and suitability of e-learning materials. Metadata would describe the creator, the intended purpose or possible uses of the material, the date the material was created and other relevant factors. The purpose of metadata is to allow potential users to quickly and easily find and evaluate e-learning objects. Metadata can be used to improve the search process, to build user-specific, guided paths, and to maintain relationships among disparate educational resources. Several metadata projects are under development to target and standardize the instructional qualities that are most useful in describing educational resources. The efforts of these projects will provide a metadata foundation that can be leveraged by future instructional applications. It is obvious that the continued success of the Internet is contingent upon automated tools that efficiently guide the information gatherer toward relevant and appropriate material (Markus, 2000). The knowledge base for surveying is vast and not completely defined. The materials used to form an e-learning experience come from a wide variety of sources. In some cases, they are merely text copied from published textbooks and/or manuals. In other cases they may be presentations such as PowerPoint slides or handouts, live or recorded digital audio, or live or recorded digital video. The knowledge base can be in modular or course form with modular form (e.g. learning objects) being the recommended format. The knowledge can be built by the instructor, borrowed from a virtual library, or purchased from a vendor. In a Learning Content Management System all the materials can be organised and easily accessed. In the past few years a new wave of internet technology, Web 2.0, has emerged with the potential to further enhance teaching and learning environment in higher education (Ajjan & Hartshorne, 2008). With the use of Web 2.0 students no longer access the web only for course information and content; they can do much more. Students access the web, collect different pieces of information and create new information that could be shared with others. Web 2.0 applications replace the traditional passive modes of content delivery, such as posting lecture notes and videos, with the knowledge generated by the group. Examples of Web 2.0 technologies include wikis, blogs, instant messaging, internet telephony, social networking sites, podcasting and online media sharing (Groenendijk, 2009). Blogs (abbreviated from weblogs) are web-based publications consisting primarily of periodic articles (normally in reverse chronological order) containing text, images and links to web content, such as websites or other blogs. Blogs have a variety of formats and might include the user expressing their opinion about a topic or documenting activities. Blogs are often used as online diaries. Blogs are interactive in the sense that other users could provide comments on the information posted by the blog author. Educational applications of blogs include researching, tracking, interpreting, and evaluating blogs for political commentary, cultural events, business, or other news and for examining changes over time. Blogging is now being used as a tool for students to keep records of their learning. They also allow feedback from instructors and other students. Blogs can be used by single students or by groups of students to share ideas, progress on projects, or to pose questions (Ajjan & Hartshorne, 2008; Kottyan, 2008). Wikis (What I Know Is) refer to collaborative websites that allow users to interact by adding, removing, or editing site content. The most well-known wiki implementation is Wikipedia (http://wikipedia.org/). A wiki is a type of website that allows anyone visiting the site to add, to remove, or otherwise to edit all content, very quickly and easily, sometimes without the need for registration. This ease of interaction and operation makes a wiki an effective tool for collaborative learning and collaborative writing. Wiki is popular software that can be used for student collaboration on projects. Wiki allows multiple users to work on the same document(s) from several locations, offering a platform for online group work with students from all over the world in distance education courses (Molendijk, 2008). Wiki’s allow students to work on documents or presentation media collectively, with a history of changes always available (Cepek and Pytel, 2006). Instant messaging (IM) is a collection of technologies that create the possibility of realtime text-based communication between two or more participants over the internet or some form of internal network/intranet. – Chat happens in real-time. IM allows effective and efficient communication, featuring immediate receipt of acknowledgment or reply. In certain cases Instant Messaging might involves additional features, which make it even more popular, i.e. to see the other party, e.g. webcams, or to talk directly for free over the internet (Yahoo! Messenger, Windows Life Messenger, Skype). Social networks allow users to create personal profiles and establish a variety of networks that connect him/her with family, friends, and other colleagues. Users of Hyves, Facebook, or LinkIn, for example, utilize these sites to stay in touch with friends, make plans, and find new friends, to find old schoolmates or to maintain and extend their professional network. A recent newcomer in social networking is Twitter: a free social networking and micro-blogging service that enables its users to send and read messages known as tweets (http://wikipedia.org/, accessed 31.08.09). Podcasting and webcasting, created either by instructors or by students, are another new phase in e-learning. While the term comes from a blend of the terms iPod and broadcasting any computer capable of viewing multi-media electronic files are used as the instruction medium. Students can produce presentations that can be shared with other students. Students download the podcasts, which can be either audio or video or both, to view inside or outside the classroom (Frank, 2009). Podcasts are developed by lecturers for guiding students during practical work in the field. Media sharing websites such as YouTube allow students to find informative videos or to create short videos films that can be shared with the world. Teachers use YouTube to publish educational videos or refer to videos with interesting content, demonstrations or complete courses1. Online applications, such as Google Earth and other Virtual Globes, offer excellent opportunities for e-learning in surveying and geospatial information education (Groenendijk, 2009). A learning object could be a text file, a videotaped lecture or a computer exercise. The Learning Object Standard addresses the accessibility, reusability and interoperability of learning objects. Accessibility refers to the use of metadata so that learning objects can be identified and evaluated. Reusability allows a learning object to be used in different instructional contexts. Interoperability requires that the learning object be independent of both the delivery system and the knowledge management system (Polsani, 2003). The premise is that educational components could be built that would be reusable in many contexts. Users would be able to combine learning objects to create a new educational experience such as a course, seminar, etc. (Wiley, 2000). The Sharable Content Object Reference Model (SCORM) defines, packages and manages learning objects. Sharable Content Objects are another term for e-learning objects. The standards addresses how these objects can be created to be reusable across a variety of learning systems. Included in the standards are methods of packaging data for multiple uses, compressing (zipping) data for transfer, and sequencing data for student acquisition (SCORM, 2004). As mentioned in earlier chapters, the basis of e-learning is digital technology – computers and computer networks. The Internet allows one to reach out across town or across continents to deliver e-learning courses. Broadband computer networks allow vast quantities of data to be moved quickly and efficiently from computer to computer. Advances in computer software and hardware allow new and innovative approaches to teaching and learning. This can present problems as some parts of the globe do not have broadband Internet access and/or do not have dependable sources of electricity to run their computers (Olaniyi, 2006). discussed in Chapter 2 and in other parts by use of vendor or open platform software specifically developed for e-learning purposes. Special software for organizing e-learning (called platforms) can be used to manage e-learning. E-learning is, for the most part, dependent on the Internet. Broadband Internet access is necessary to use most e-learning objects other than text documents. This can still be a problem in some parts of the world. E-learning is made simpler by the use of Learning Management Systems (LMS) which can create portals on the Internet through which students can easily find and access learning objects. These systems, often called e-learning platforms, are placed at the portals to allow instructors and administrators to organize and deliver educational courses. E-learning platforms are software that organize and automate many of the activities associated with e-learning. These platforms can be organized in a variety of ways. E-learning platforms offer users a structure that can be easily adapted to multiple uses from augmentation of “brick and mortar” education to stand-alone training exercises. They allow easy organization of e-learning materials with relatively easy user interaction (Milenov and Kay, 2008). Students may use them to work on group projects, take online quizzes and examinations, and turn in assignments (Markus, 2006). They can allow students to register for classes, pay for classes, and take classes all online. They can allow educators to present learning materials, monitor student activity and assess student learning (Australian Flexible Learning Community 2002). The platforms are commercially available (like WebCT, Blackboard) or Open Source (Moodle, etc.). Initially learning management systems were dominated by content, but over the last four to five years Web 2.0 features were added to facilitate communication and collaborative learning. Internet discussion boards and forums, chats, wikis and blogs are common collaborative learning tools integrated in the learning management systems. Discussion boards can be used both formally and informally in e-learning. Students are able to discuss their understanding of topics with other students and with instructors outside of the virtual classroom. An example of the use of Web 2.0 tools in distance education is Virtual GEO, an educational portal of the University of West Hungary. The portal is based on the open Learning Management System Moodle and makes use of blogs and wikis (Kottyan, 2006, Kottyan, 2008). The Institute of Surveying, Remote sensing and Land Information at the University of Natural resources and Applied Life Sciences, Vienna, also make use of Moodle. An evaluation their e-learning experiences with communication tools in Moodle is presented by Mansberger et all (2008). Skype, and different kinds of messengers, allows audio/visual group communication. Similar to a conference call with telephones, Skype conference calls allow cheap, realtime communication. A simple webcam can be added at the instructor’s computer to give visual capabilities so that students can see demonstrations and lecture. 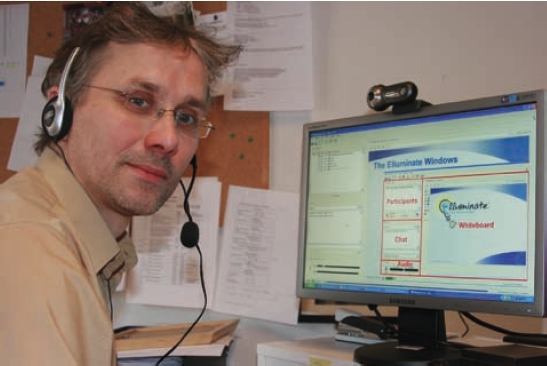 Additional cameras at students’ computers allow face-to-face interchange between the instructor and students (Todorovski 2008; Wahlstrom 2008). There are literally thousands of software applications available for building and managing e-learning courses. Most of the conventional software applications used for learning and business, such as word processors, slide presentation software, video software and others can and have been adapted to create material for e-learning courses. A plethora of new software applications aimed directly at creating e-learning courses and materials have also emerged. Companies like Adobe, Articulate, imc AG, Lectora, RapideL and SoftChalk, to name a few, make software specifically aimed at developing e-learning applications. Most of the software appear to support the standards discussed in chapter 2.6. The trend is towards open source and web-based learning. Online applications, such as Google Earth, that focus on geospatial information, are being designed for e-learning and are being incorporated into e-learning exercises. Repositories of digital information (virtual libraries) can be accessed to assist e-learning. Originally developed by converting brick and mortar library records to electronic form, they have expanded to include a vast array of digital information and data. Specialized virtual libraries contain electronic records specific to one or more related topics. FIG maintains a virtual library of papers presented at FIG workshops, annual working weeks and conferences. Virtual libraries are indexed databases of electronic educational materials. They are places where instructors, researchers and students go to find electronic publications on research, theory, history and other important aspects of a particular theme. In cases where the learning material is not in electronic form users may search and order or reserve copies of the materials. Most academic and national libraries have developed virtual capabilities where electronic copies library resources may be downloaded. Virtual libraries can contain digital copies of textbooks, audio, video, software, datasets and other resources that can be quickly accessed by people all over the world. Language will always be a barrier to some but virtual libraries are being developed in most of the World’s major languages. In addition to traditional libraries being put online in electronic format, new virtual libraries are being developed as repositories of learning and other materials. In the United States, as in many other countries, a national geospatial data clearing house has been established with links to various local, state and national geospatial data including survey, mapping, and GIS data. The sites are maintained primarily by government agencies and provide a wealth of geospatial information. These materials are being incorporated into many e-learning courses. Other new virtual libraries are being developed that are repositories of e-learning materials. Structure on the IEEE Learning Object model, they allow access to learning objects and learning object metadata. These libraries consist of e-learning objects that can be accessed and reassembled to modify existing courses or to develop new courses. Access to virtual libraries may be free to all, free to subscribers or at some cost to subscribers. Subscribers may pay either a set periodic access fee or pay individually for each item they download. Good practices require that virtual libraries contain metadata of the learning materials available so that students and instructors can evaluate the usefulness of those materials for a particular need. The accessing the data need to know not only the content of the information and/or data but also any special data formatting or other characteristics that will allow them to evaluate whether they have the necessary software to take full advantage of the information and data. The role of the virtual library can not be underestimated in e-learning in academic settings. Students can access the virtual library where and whenever they like; this is an advantage in traditional, blended and complete online courses. 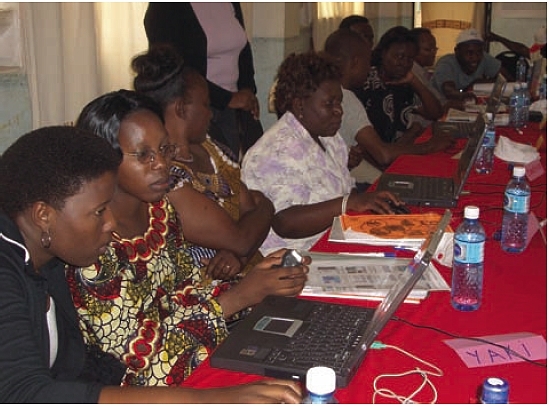 In particular e-learning courses focussing on participants from developing countries, access to online library resources is of vital importance and contributes highly to the success of these courses. The learning infrastructure encompasses the culture, processes, tools and other essences of learning. It is about creating learning environments that can develop tools and processes to improve teaching, lower costs, and provide greater access to learning. To fully realize the potential for e-learning, students, educators and administrators must re-think the concepts of education. Students must become more self-reliant and self-motivated. Educators and administrators must become more innovative and flexible. As the Internet easily reaches across international boundaries, so does e-learning. E-learning has the ability to build capacity for developing nations with agreements with institutions in developed countries. Students in developing countries will be able to receive at least a part of their education while working or going to school within their home country. Alliances formed among e-learning software developers have the advantage of extending software use within the learning community. Few developers or vendors can offer more than a few of the components needed to build a complex e-learning platform. Alliances allow vendors and developers to incorporate more and more capabilities into these systems (Barron, 2002). The end-to-end principle states that operations should occur at the end points of a system or as close to the end points as possible. In e-learning this concept would apply when knowledge is transferred from the instructor to the student. The standards discussed in Chapter 2 along with the learning platforms describe earlier in this chapter provide that end-to-end model. Students can access learning objects through a software platform that is located at a server site at the host university, agency or company. The nature of the end-to-end model for e-learning is such that the instructor and student are seeing the same material, organization of material and sequencing of material regardless of the distance between the two or the computers that they are using. To achieve and end-to-end business process, e-learning must be scalable, adaptable, agile and must establish a brand. A service-oriented, business driven approach is needed. The focus should be on user needs. Educational organizations must learn to build ever more complex and flexible applications and products over time. (Petch, 2006). To be successful, e-learning must be easily accessible and cost effective. New technology has been and is continuing to be developed that allow us to more easily structure and share e-learning. Beyond technology and learning materials, social and economic structures must be built and maintained that support e-learning. Investment in technology alone does not guarantee success (Bjorke, 2008). Learning institutions must rethink how learning is best provided to meet the legitimate needs of students and potential students. The requirements for e-learning differ quite a lot from traditional training courses: the technology (computers, software), staff equipped to develop and facilitate the e-learning courses or learning objects, technical and secretarial staff to support the smooth development and implementation of online courses or blended courses. Development of new courseware for online training programmes is more time consuming than giving a series of lectures and practical sessions, and involves advanced expertise, both technical and pedagogical. The technical requirements for e-learning, is another aspect that might lead to frustrations if not taken care of properly. Issues like bandwidth, proper software, internet access, technical support in case of troubles, need to be in place. A teacher communicating with his distance students in the Virtual Classroom. Communication with secretariat and lecturing staff has to be well organised. It is an important aspect to create and maintain a good relation and stay motivated for the course. Students in online courses depend completely on the online communication. Instructors and teaching staff must be up to date and aware of the technologies used in e-learning. They will often find that students are ahead of them in technological awareness and can learn from both formalized training and interaction with students. The preparation of e-learning materials is time consuming but can be rewarding with quality materials being produced and motivated students getting involved. The interaction among students and between students and faculty lead to continued faculty learning and awareness about e-learning. As with most successful undertakings, there must be an institutional “buy in” to e-learning, whether it is produced by academia, government or private business. There must be a commitment to invest in the technology – computers, Internet, etc. – needed to make e-learning effective and successful. Hoppe and Breitner (2003) define three types of business models for e-learning. The “market” model defines the players and the market structure. The “activity” model focuses on the activities of a business. The “asset” model looks at costs and revenue. Market based e-learning is based on supply and demand. Used by educational institutions, it uses e-learning integrated into traditional course offerings as well as for continuous learning for professional qualification. However, e-learning is used in business as much or more as in academia. With this model the student typically pays for education, or it is provided through the state, through the normal fee structures of learning. Activity based e-learning is related to customer needs. The learning is often based upon one or more specific business products, usually software. The learning may be provided directly from the business or through a service provider. Depending on the complexity of the material, the demand for the training and the willingness of students to pay for the learning, students may or may not pay for the education. ESRI e-learning fits this model. Asset based e-learning is used by academic institutions and by private businesses. Again, academic institutions may have all or a part of the costs of providing the education subsidized by the state. Students pay directly for the e-learning content independent of other educational costs. Academic institutions may themselves be the users of the content, either for in-house use or to pass on to students. Payment may be by the course or by periodic membership fees. Business factors driving the business models are various. Along with traditional university degree programs, there are continuing education demands that are being met through e-learning. Learning organizations, including universities, are offering nondegree certifications on topic areas that enhance employment qualifications. They provide coursework required by regulations on continuing professional development. And they provide ongoing training on new equipment and software (Barron, 2002). Business models for academic programs can vary widely. An e-learning consortium model is used by several universities in Europe. Each university contributes one or more e-learning courses to a pool of courses. For each course contributed, the university gains access to a certain number of courses from other universities. Each e-learning course is developed from existing courses at the university. The university delivers the full course to other universities including instructor time (Blok, 2008; Markus, 2006). Perhaps the greatest benefit of e-learning is shown in the recent U.S. Department of Education publication „Evaluation of Evidence-Based Practices in Online Learning: A Meta-Analysis and Review of Online Learning Studies” (Means et al, 2009). This study looked at various empirical studies done on e-learning between 1996 and 2008 and concluded that students using e-learning performed better than students who did not use e-learning. The students who performed best were those who received blended learning. The studies were primarily performed in higher learning environments such as professional education. Other benefits fall into academic, economic, and social realms. Academic benefits include increased access to knowledge through online resources, ease of revision of course materials, ability of students to connect with experts around the world, a more active role for learners in setting the pace of their learning, more flexibility for both instructors and students, and scalability of courses from small to large numbers of students simultaneously (Lam 2008, Mansberger et al, 2006, 2008; Markus, 2006). Economic benefits can include the ability to expand student enrolment, reduction of student travel, ease of revision of course materials and reduction of teaching facilities (Mansberger et al, 2006; Olaniyi, 2006). Social benefits are mixed. While it can be more difficult to motivate students when using e-learning (Bjorke, 2008), students who can self-motivate have a more direct control over their individual learning (Olaniyi, 2006). Within the last decades the introduction of computers has changed rapidly the society, science and technology around the surveying profession (Markus, 2008). Changes took place in the field of data collection, data storage, data processing and visualisation. New technologies appeared, which – 20 years ago – were not known by most of the surveyors and other professionals involved in spatial data capture, like GNSS (Global Navigation Satellite Systems), GIS (Geographic Information Systems), Laser Scanning, Digital Photogrammetry or Web Technologies. These new technologies require additional technical knowledge. 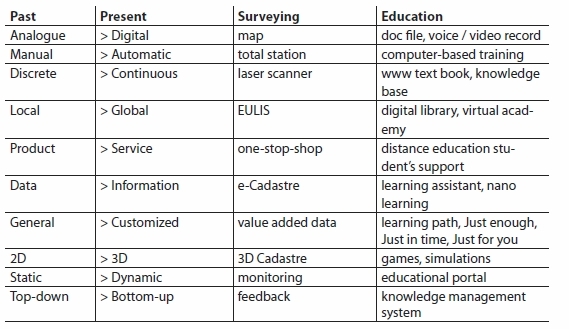 Table 1: Technological trends and changes in surveying and education due to introduction of computers. In a global perspective the role of surveyors is also shifting: Enemark (2009) entitles the change as the big swing “From Measurement to Management” in the sense that surveyors have extended their technical knowledge by social, legal, economic and environmental understanding. The new professional fields require a change in the professional education and training. A new kind of knowledge is needed. Enterprises and professional institutions expect Employability from the alumni of academic studies: that means subject specific basic knowledge, professional technical and methodological competence as well as generic competences and skills, like the ability to communicate, the capacity for teamwork, the learning aptitude and the capability for analysis. Besides the new requirements from a professional point of view the academic surveying education nowadays is affected by additional determining factors: Globalisation, demographic development, and new public management: Table 1: Technological trends and changes in surveying and education due to introduction of computers. Globalisation will force academic institutions to cooperate, to exchange staff members and students, but also to sharpen their individual profiles to prove in the national and international competition. In the next 40 years worldwide the population will increase approximately by 30 percent. But the detailed figures show a sharp contrast in the democratic development between countries. In some regions (especially in Europe) the population is decreasing (UN, 2008). Both developments are a challenge for educational aspects. Within the last years at many (especially European) universities new public management was implemented. The benefit of an increased flexibility of financial resources and of the self-reliance in human resource management is accompanied by additional administrative duties and tasks for staff members (Mansberger et al., 2006). Education has to focus on students, to learning processes and to learning outcomes. Traditional, subject-orientated teaching has to be substituted by individual project-orientated and self-organised learning. Teachers have to change their role from presenters and instructors to facilitators, mentors, tutors, coaches, and consulters (Wildt, 2008). Modern educational methods enable self-paced and self-directed learning with a high flexibility on time and site. So learning materials and most of the support has to be available 24 hours / 7 days (Markus, 2006). The increase of worldwide knowledge is estimated to be doubled within four years. Therefore the existing concept of self-contained study courses has to be replaced by the concept of continuing professional development. E-learning services designed using learner-centred approaches. E-learning gives learners a chance to speed up or slow down as needed. E-learning can happen when needed. It enables a high flexibility on time and site for teachers and students. E-learning does not require physical presence. E-learning promotes greater student interaction and advances collaboration. E-learning uses interactive technology to develop fun, engaging, effective simulations. E-learning is just a tool and Learning is the objective. Powerpoints and scripts to download on the internet are not e-learning. Pedagogy must take the lead, while technology responds to the pedagogical training (Bjørke, 2008). E-learning does not save time for the teachers – but it improves the knowledge transfer. Virtual communication cannot completely substitute personal communication (Mansberger et al., 2008). The introduction of e-learning requires accompanying measures. Teachers have to acquire new competences: Information and Communication Technologies (ICT) as well as e-pedagogy are needed ingredients for operating e-learning. In this point surveyors are favoured as they are very familiar and skilled in working with ICT. Institutions dealing with surveying education also have to redesign the curricula: Subjects, contents and learning methods have to be adapted to e-learning to meet the demands of employability. And finally, high priority must be given to the introduction of a quality assurance system to guarantee the high level of academic surveying education. The urgency of this requirement is enhanced by the increased time-independency as well as site-independency of students and lecturers due to international mobility programs and the availability of new electronic teaching tools (Mansberger et al., 2006). In the early days of e-learning discussions were dominated by content. The content still remains a constant factor in e-learning, but with the introduction of Web 2.0 technologies to the higher education the focus shifted towards online communication and collaboration (O’Reilly, 2006). Workshops and conferences organised by FIG Commission 2 (Professions Education) have identified a large evidence of e-learning projects and a high level of acquired experience within the academic surveying community. The topics for Lessons Learnt in the field of e-learning are manifold and cover educational, didactical, pedagogical issues, but also technical and economical aspects. Experiences of experts in surveying education with e-learning and developments of practical e-learning materials are published in the proceedings of above mentioned conferences (FIG, 2006; FIG, 2007; FIG, 2008; FIG, 2009). It is the order of the day to share this knowledge within the professional community to enable an improvement of academic surveying education on a global level. Demandorientated education outlined by modern and up-to-date learning technologies is the best promotion for the surveying profession and a conditio sine qua non for the recruitment of students. 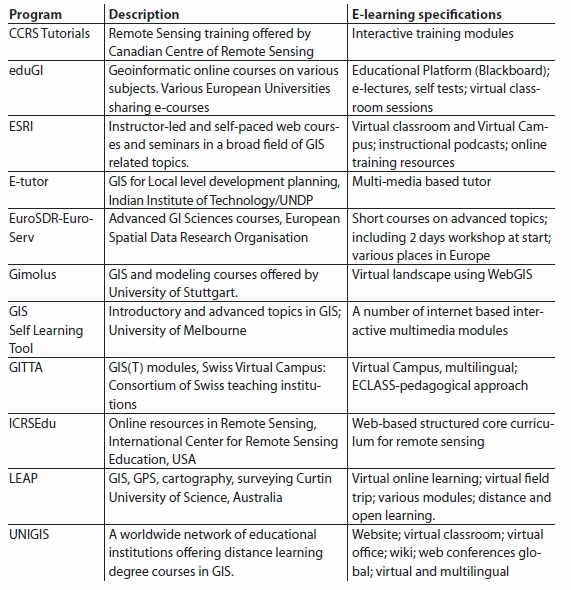 Table 2: Overview of major online distance programs offered in the field of surveying, geo-information science and remote sensing. E-learning is an important driving force for the implementation of up-to-date learning activities. Technology-enhanced learning also opens global classrooms: e-learning is a catalyser for collaboration across national and international boundaries as well as a facilitator for worldwide networks of academic learning communities. These networks facilitate the development of high quality courses and study programmes ensuring currency, relevance and a broad curriculum catalogue (Bjørke, 2008). Working together, sharing of experiences and resources, is considered of great importance for the success and further development of e-learning in the field of surveying, geo-information science and land administration (Groenendijk, 2008). New national and international partnerships between academics and professionals have to be established with the objective to share knowledge in the development of staff, in the development of learning contents, in the development of pedagogic concepts, and in the development of business models. But all the activities and efforts of creating international learning communities have to take into consideration the regional requirements of learning outcomes, the cultural differences in learning style and content, and the language barriers. From a technical point of view the limiting factors of e-learning are the access to computers and the internet penetration within a region or a country. The current increase and improvement of technologies and methods and the new needs of employability in the field of surveying profession necessitates a continuous knowledge gain surveying experts. University graduation is no longer a ticket for professional career. Learning for life has to be shifted to life-long learning (Enemark, 2009) to meet the challenges of this accelerated change of requirements for profession. Additionally, the need for more flexible learning paths will keep growing in the future to react to the ever-faster changing needs of the labour markets, to the demographic developments and to the more mobile workforce (Bacher, 2009). Academic surveying institutions have to provide life-long-learning. University studies and traditional professional education have to be adapted, have to be extended by (part-time) training programmes and have to be integrated to a system of Continuous Professional Development (CPD). to improving dissemination of information on educational theory and practice to the members across the world. FIG will stimulate e-learning by raising the awareness about the paradigm shift in education from teaching to learning, by communicating employability and life-long-learning as the new requirements for an up-to-date academic professional education, and by incentivising teaching staff (e.g. FIG award for e-learning). FIG will distribute information on the topic of e-learning to the surveying community, e.g. by publishing conference papers, by this booklet on e-learning, by compiling a reference book about e-learning or by a register of “good practice”. FIG will bring experts together to share their knowledge on the topic of e-learning. This can be done physically during conferences or workshops or virtually in form of electronic discussion forums. FIG promotes e-learning networks starting with FIG Commission 2 as a seed. But FIG will also increase cooperation on the topic of e-learning with other organisations in the field of geosciences, like ISPRS and ICA. FIG will encourage their members to develop and share e-learning contents within surveying education. This can be achieved by the establishment of a database with specific learning materials, such as literature, scripts, interactive learning tools, test questions, etc; and through development of a quality assessment guide for e-learning courses. FIG will influence and encourage governmental and administrative bodies to support the introduction of e-learning and life-long-learning as well as to provide the political frame conditions to enhance these activities. Ajjan, H. and R. Hartshorne (2008). Investigating faculty decisions to adopt Web 2.0 technologies: Theory and empirical tests. Internet and Higher Education 11, 71–80. Australian Flexible Learning Community (2002). Retrieved June 5,2009, from: http://community.flexiblelearning.net.au/TechnologiesforLearning/content/article_442.htm. Bacher, G. (2009). The European Higher Education Area: Goals Achieve & Outlook towards 2010 and Beyond. FIG Workshop on Navigation the Future of Surveying Education, Vienna, Austria. 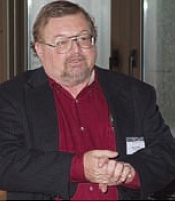 Barron, T. (2002). Evolving Business Models in eLearning. Summary white paper: Learning on Demand. Retreived June 30, 2009, from http://www.sric-bi.com/LoD/summaries/EvolvBizModelsSum.pdf. Beck, R. J. (2007) What are learning objects? Retrieved December 25, 2009, from: http://www4.uwm.edu/cie/learning_objects.cfm?gid=56. Bjorke, S. A. (2008). Challenges and training needs of E-supporters. Sharing Good Practices: E-learning in Surveying, geo-information Sciences and Land Administration. 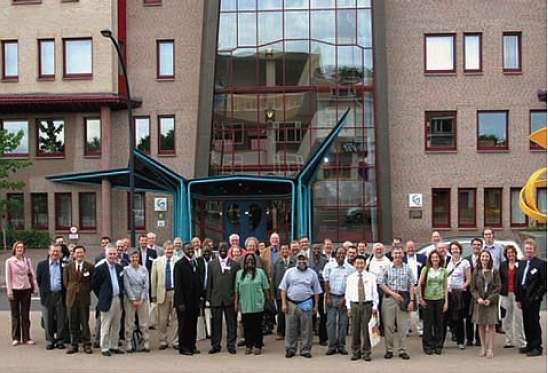 FIG International Workshop, Enschede, Netherlands, 11–13 June, 2008. Blok, C. A. (2008). Sharing e-courses in GI science with partners: business model, experiences, and lessons learnt. Sharing Good Practices: E-learning in Surveying, geoinformation Sciences and Land Administration. FIG International Workshop, Enschede, Netherlands, 11–13 June, 2008. Cepek, A. and J. Pytel (2006). Collaborative Academy. FIG Workshop on eGovernance, Knowledge Management and e-learning. Budapest, Hungary, 2006. Chiappe, A. et al., 2007: “Toward an instructional design model based on learning objects”, in Educational Technology Research and Development, Springer, Boston, pp. 671–681. Enemark, S. (2007). Promoting the interaction between education, research and professional practice. Proceedings FIG Commission 2 – Symposium, Scientia est Potentia – Knowledge is Power, 7–9 June 2007, Czech Technical University, Prague, Czech Republic. Enemark, S., 2009: Surveying Education: Facing the Challenges of the Future, FIG Workshop on Navigation the Future of Surveying Education, Vienna, Austria. Fairlie, K. (2009). Navigating the global consciousness: a young surveyor’s future. Proceedings FIG Working Week, Surveyors key role in accelerated development, 3–8 May 2009, Eilat, Israel. FIG (1996). FIG Publication no. 15. CPD – Continuing Professional Development and its future promotion within. FIG (2006) Workshop on eGovernance, Knowledge Management and e-learning; Proceedings. Editor: Bela Markus. Published by College of Geoinformation. University of Hungary. April 2006. Budapest. Hungary. FIG (2007). Scientia Est Potentia; Jubilee Proceedings. Editor: Aleš Čepek. Published by the Czech Technical University in Prague. June 2007. Prague. Czech Republic. FIG (2008). FIG International Workshop. Sharing Good Practices: E-learning in Surveying, Geo-Information Sciences and Land Administration. Proceedings. Editors: Liza Groenendijk, Christian Lemmen. Published by International Institute for Geo-Information Science and Earth Observation (ITC). June 2008. Enschede, the Netherlands. FIG (2009). FIG Workshop on Navigation the Future of Surveying Education. Proceedings. Editor: Austrian Society of Surveying and Geoinformation. Österreichische Zeitschrift für Vermessung und Geoinformation (vgi). 97.Jahrgang, Heft 1/2009. Vienna, Austria. Groenendijk, E. M. C. (2009). “Experience-based learning and e-learning: a perfect combination.” International Archives of Photogrammetry, Remote Sensing and Spatial Information Sciences 38(6/W7). Groenendijk, E.M.C. (2009). Experience-based learning in the geo-information sciences: 15 years of nuts game. Proceedings FIG International workshop, Navigating the future of surveying education, 26–28 February 2009, Vienna, Austria. Groenendijk, E.M.C. (2008) Sharing Good Practices in E-Leaning: outcome of a workshop. FIG International Workshop Sharing Good Practices: E-learning in Surveying, Geoinformation Sciences and Land Administration. Enschede, Netherlands. 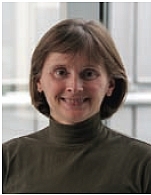 Hodgins, W. and M. Connor (2000). Everything you wanted to know about learning standards but were afraid to ask. Line Zine, Fall 2000. Online version. Retrieved June 5, 2009, from http://www.learnativity.com/standards.html. Hoppe, G. and M. H. Breitner (2003). Business Models for E-learning. University of Hannover, Discussion paper 287. Retrived from June 1, 2009, from: http://www.wiwi.uni-hannover.de/Forschung/Diskussionspapiere/dp-287.pdf. Kottyan, L. (2006). Open systems in e-learning. In: Proceedings FIG Workshop eGovernance, Knowledge Management and eLearning, 27–29 April 2006, Budapest, Hungary. Kottyan, L. (2008). Sharing student knowledge in exchange programs. In: Proceedings FIG International Workshop. Sharing Good Practices: E-learning in Surveying, Geoinformation Sciences and Land Administration, 11–13 June 2008, ITC, Enschede, the Netherlands. Lam, S. Y. W. (2008). Blended e-learning Model for Geomatics Curriculum: Design, Implementation and Evaluation. Proceedings of FIG Commission 2 Workshop, Sharing Good Practices: E-learning in Surveying, Geo-information Sciences and Land Administration, 11–13 June, 2008, Enschede, Netherlands. Learning organization (2009). Retreived 8 Aug 2009, from: http://en.wikipedia.org/wiki/Learning_organization. Macromedia (ND). E-learning Standards. Online document. Retrieved June 5, 2009, from http://www.adobe.com/resources/elearning/standards.html. Mansberger, R., C. R. Michalek, and T. Bauer (2008). Communication Tools in E-learning: Experiences in Academic Geomatics Education, Sharing Good Practices: E-learning in Surveying, Geo-information Sciences and Land Administration, FIG International Workshop, Enschede, the Netherlands, 11–13 June 2008. 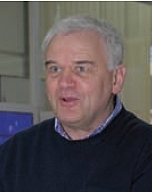 Mansberger, R., H. Schuh, G. Steinkellner (2006). Impacts of the Bologna Process and of New Public Management on the Academic Surveying Education in Austria. XXIII International FIG Congress, International Federation of Surveyors. Mansberger, R., T. Bauer and E. Heine (2006). Flop or Top – Experiences with E-learning in Academic Education. FIG Workshop on eGovernance, Knowledge Management and eLearning, Budapest, Hungary, 2006. Markus B. (2000): Educational metadata, FIG Working Week, Prague, Czech Republic. Markus B. (2002). (Global) spatial knowledge management, GSDI 6 Conference – From global to local, Budapest, Hungary. Markus, B. (2006). Experiences in and Around e-learning. Proceedings XXIII FIG Congress, Shaping the Change, 8–13 October, 2006, Munich, Germany. Markus, B. (2008). Thinking about e-learning. Proceedings FIG International Workshop. Sharing Good Practices: E-learning in Surveying, Geo-information Sciences and Land Administration, 11–13 June 2008, ITC, Enschede, the Netherlands. Means, B., Y. Toyama, R. Murphy, M. Bakia and K. Jones (2009). Evaluation of Evidence-Based Practices in Online Learning: A Meta-Analysis and Review of Online Learning Studies. U.S. Department of Education, Center for Technology in Learning, May 2009. Milenov, P. and S. Kay (2008). Provision of technical support and regulatory reference information on the control of agricultural subsidies in EU through use of Wiki-based Knowledge Management. Sharing Good Practices: E-learning in Surveying, geo-information Sciences and Land Administration. FIG International Workshop, Enschede, the Netherlands, 11–13 June, 2008. Molendijk, A. M., H.J. Scholten & J. Kaandorp (2008). Geographical Information for all: Breaking the Barriers for GI Distance Learning. In: Proceedings FIG International Workshop. Sharing Good Practices: E-learning in Surveying, Geo-information Sciences and Land Administration, 11–13 June 2008, ITC, Enschede, the Netherlands. O’Hear, S. (2006). How E-learning 2.0 – How Web technologies are shaping education. ReadWriteWeb. Retrieved June 1, 2009, from: http://www.readwriteweb.com/archives/e-learning_20.php. Olaniyi, S. S. (2006). E_learning Technology: The Nigeria Experience. Shaping the Change: XXIII FIG Congress, Munich, Germany, October 8–13, 2006. O’Reilly, T., 2006: http://radar.oreilly.com/archives/2006/12/web-20-compact-definitiontryi.html, last visited: 12 April 2008. Osskó, A. (2008). The importance of changes in land surveyors’ education. Proceedings FIG International Workshop. Sharing Good Practices: E-learning in Surveying, Geo-information Sciences and Land Administration, 11–13 June 2008, ITC, Enschede, the Netherlands. Pasternack, P., R. Bloch, C. Gellert, M. Hölscher, R. Kreckel, D. Lewin, I. Lischka, A. Schildberg (2009). Die Trends der Hochschulbildung und ihre Konsequenzen. HoF Wittenberg – Institut für Hochschulforschung an der Martin-Luther-Universität Halle-Wittenberg. Bundesministerium für Bildung, Wissenschaft und Kultur (BMBWK). Wien. Retrieved September 29, 2009, from: http://www.bmwf.gv.at/uploads/tx_bmwfcontent/studie_trends_hsbildung.pdf. Petch, J. (2006). All things „e”: understanding the real challenges in an accelerating world. FIG Workshop on eGovernance, Knowledge Management and e-learning. Budapest, Hungary, 2006. Polsani, P. (2003). Use and Abuse of Learning Objects. Journal of digital information. Vol 3, Issue 4, Article No. 164, 2003-02-19. Online version. Retrieved June 5, 2009, from: http://www.labunix.uqam.ca/~nkambou/DIC9340/seances/seance10et12/Standards%20et%20LO/http___jodi.ecs.soton.ac.pdf. SCORM (2004). SCORM Explained. Online document. Retrieved June 5, 2009, from: http://www.scorm.com/scorm-explained/. 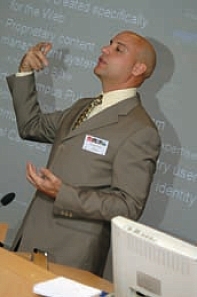 Todorovski, D. (2008). Capacities, tools and methods that support E-learning. Sharing Good Practices: E-learning in Surveying, geo-information Sciences and Land Administration. FIG International Workshop, Enschede, Netherlands, 11–13 June, 2008. UN, 2008: United Nations Department of Economic and Social Affairs. World Population Prospects: The 2008 Revision. Retrieved September 22, 2009, from: http://www.un.org/esa/population/publications/wpp2008/wpp2008_highlights.pdf. Verkroost, M. J. (2009). From multi-usable courseware to a multi-usable pedagogy. In: Proceedings ISPRS Workshop Commission VI/2 V12, E-learning Tools, Techniques and Applications, 17–19 June, 2009, Potsdam, Germany. Wahlstrom, D. A. (2008). Distance Education Using Contemporary Technology. Sharing Good Practices: E-learning in Surveying, geo-information Sciences and Land Administration. FIG International Workshop, Enschede, Netherlands, 11–13 June, 2008. Wildt, J. (2008). Reader “Lehren und Lernen”. Manuscript of the Course on Didactic 2008/09 at the BOKU-University of Natural Resources and Applied Life Sciences Vienna. Centre for Research on Higher Education and Faculty Development of the University of Technology Dortmund. 2009. Wiley, D. A. (2000). Connecting learning objects to instructional design theory: A definition, a metaphor, and a taxonomy. In D. A. Wiley (Ed. ), The Instructional Use of Learning Objects. Retrieved June 1, 2009, from: http://reusability.org/read/chapters/wiley.doc. The UNIGIS network of universities has provided postgraduate distance learning in Geographic Information Science and Technology (GISc&T) since the early 1990s (Molendijk and Scholten, 2006) based on a model developed in the UK in 1988–89. It has grown from a UK partnership, to a European consortium into a global network offering different types of academic programmes and qualifications in several languages to students with a wide range of backgrounds (http://www.unigis.net/). This success is based on two sets of factors related first to the setting up and secondly to the sustaining of a programme of learning which has continued to meet a vigorous market demand. These factors provide insights into good practice for all aspects of such distance learning provision and they may hold lessons for other programmes. From the outset UNIGIS was conceived as cooperation between institutions which could benefit from the sharing of resources and expertise and who by committing to a common purpose could each achieve success in reaching a growing market that alone they could never aspire to. Additionally cooperation was seen as a fast track and a sustained track to innovation and continuing progress in a rapidly changing field. Thus a prime building bock of the collaboration has been a contract that sets out these aims and principles in a transparent manner. Everyone has a stake in the collaboration and clear benefits. Having such a contract has ensured recruitment to the network and ensured continuing commitment and inputs to the common cause. A further factor for success has been the careful selection and grooming of potential partners and a corresponding clear commitment to continuing support once they are members. The UNIGIS network didn’t aim to recruit the most famous names or the biggest GI operations. Size didn’t matter. What mattered were ambition, a willingness to share and cooperate and a commitment to stay on course. Potential members had to show that being a member would make a difference to them and that being part of UNIGIS was part of their strategy. Sustained resourcing and maintained objectives were an essential criterion for membership. Joining UNIGIS had to be an institutional commitment. A major benefit for joining UNIGIS, that was a conscious part of agreements, was being able to plug in immediately to a mature, quality assured course with proven processes and instruments for administration, design and development. This strategy has in fact brought other benefits. As new members join they bring their own good practices and enrich the understanding of the wider group as to what works well and what does not. With an active, involved community there is a constant development of all aspects of the course and this is reflected in a strengthening array of practices. The lesson here is that usage and challenging of practices makes for improvement. But, the prerequisite is the adoption of common practices in a trusting group. Many other aspects of the UNGIS experience show the importance of sustaining good practice, which means renewal and constant improvement. This focus on quality has many facets (Strobl and Car 2009). formal accreditation and quality indicators. With UNIGIS programmes primarily taken in part-time in-service mode by professionals already active in the field of GIS&T, learning is directly coupled with professional practice. Employers have and express clear expectations and learners already know from on-the-job experience about their strengths and weaknesses, and thus about deficits to be compensated and gaps to be filled. In-service programmes therefore undergo constant practical checks of relevance, and receive immediate feedback regarding topical priorities and curricular completeness. Additionally, students are sensitized to topics currently dealt with in their study programme, and to recognize issues in their professional practice which otherwise would have gone unnoticed. This kind of awareness building is a core objective of advanced courses; seeing problems often is a more critically important qualification than solving them. Reputation is a critical factor in sustaining success, whether in education or other knowledge-centric activities. A documented and evident track record, as well as word of mouth recommendations, of delivering what has been promised, of fulfilling the personal and professional objectives of students, and above all of advancing the professional capabilities and careers of alumni are important factors in attracting and convincing future applicants to pursue a particular education track. The UNIGIS programme has spawned a number of informal communities of practice and institutionalized a loosely knit alumni network (‚Club UNIGIS‘) based on its strength of not having a clearly defined operational mission. Rather, this network, like other groups in UNIGIS autonomously collaborates on a broad range of topics from simple (to rather complex) technical support to information about job offerings, jointly tackling more complex projects or looking for particular expertise on a given subject. There is a lot of giving and taking across this network, recently most valuable professionals (MVPs) were identified by their generous contributions through sharing advice and offering support. All this works without an organisational framework or institutional infrastructure, demonstrating the power and effectiveness of online communities sharing a common purpose. For the entire UNIGIS network, a common core curriculum is a key constituting element, a strong common denominator binding programmes in a variety of languages, institutional and legal frameworks and variants in their mode of delivery together. In a continuously evolving environment like GISc&T, a curriculum cannot be considered as being set in stone, it rather has to adjust to innovation, demands from professional practice, and an expanding set of application domains. Rapid change, though, would create confusion and organisational challenges, and unstable expectations regarding educational outcomes. Therefore managing curricular change is an ‚art‘ of balancing adaption and innovation with a certain level of stability and continuity. Curriculum development is a major ‚export article‘ of UNIGIS, as partners in the network have been and still are involved in curriculum development projects around the world (see e.g. Car and Strobl 2007; http://tempus.geoinfo.geof.hr/). Typically conducted as consortia projects in particular regions, and frequently co-funded by European Commission programmes, new curricula (plus their implementation) are set up at institutions launching or enhancing education in GISc&T. The distance learning / eLearning / online learning mode of delivery clearly is the key factor why prospective students choose this type of programme. Over several years it has become increasingly evident that there is no one-size-fits-all model for organisation and delivery of postgraduate qualifications in GISc&T (Howell et al 2003). Full distance learning serves part-time students well while there is a growing demand for ‚going back to school‘ for a condensed full-time study experience (which might be split over several periods) or even entering postgraduate online learning immediately after undergraduate studies. balancing an accepted core set of knowledge and skills with flexible options to enable individual choices of elective subjects. While distance learning clearly is important, it is not a value per se. It is valuable, if it enhances the accessibility of continuing education for a target group of learners. The actual issue therefore is catering to the needs of a mature, well motivated and professionally active community of learners who are less mobile due to their job locations as well as social commitments. Bridging distances, and facilitating communication by online media is a very helpful element in allowing access to continuing education. International differences in educational systems, cultural expectations, online access and levels of prior learning are significant. Maintaining a common standard of across qualification systems in different countries turns out to be an impossible objective and likely will be a challenge forever. Nevertheless, the professional commonality between North America and Central Asia, between Europe, Latin America and the Indian subcontinent is greater than it might be expected, not the least due to the unifying and ‚standardizing‘ force of a global software industry and common issues in professional practice. Quality Assurance is a permanent challenge in a distributed set of programmes being taught across all boundaries of cultures, languages, professions and levels of economic development (ENQA 2005). UNIGIS (Car 2008) has therefore implemented a clearly defined framework of goals, tools and indicators facilitating the integrity, monitoring and continuous improvement of academic programmes. These start from a common core curriculum referenced to established benchmarks, standards for teaching and performance assessment, and cross-programme checks like joint degrees, credit transfer options and mutual evaluations. Car, A. (2008). Towards a Quality Assurance Concept for Postgraduate Distance Learning Programmes for Professionals. Lernen mit Geoinformation II. T. Jekel, A. Koller and J. Strobl. Heidelberg, Wichmann: 172–178. Car, A and J. Strobl (2007): TEMPUS: GISc&T Position and Role in Croatian Higher Education, [Online], available: http://vector1media.com/article/feature/tempus-%3agisc%26t-position-and-role-in-croatian-higher-education/, accessed on February 4, 2009. DiBiase, D., DeMers, M., Johnson, A., Kemp, K., Luck, A.T., Plewe, B., and Wentz, E. (2006). Geographic Information Science & Technology Body of Knowledge, Washington, D.C.: Association of American Geographers. ENQA. (2005). Standards and Guidelines for Quality Assurance in the European Higher Education Area. Bergen Report. European Association for Quality Assurance in Higher Education (ENQA) published on. Accessed from http://www.enqa.eu/files/ENQA%20Bergen%20Report.pdf, accessed on February 4, 2009. Howell, S. L., P. B. Williams and N. K. Lindsay (2003). Thirty-two Trends Affecting Distance Education: An Informed Foundation for Strategic Planning [online]. Online Journal of Distance Learning Administration. State University of West Georgia, Distance Education Center VI(III, Fall 2003). http://www.westga.edu/~distance/ojdla/fall63/howell63.html, accessed on February 4, 2009. IHEP (2000). Quality on the Line: Benchmarks for Success in Internet-Based Distance Education. The Institute for Higher Education Policy, Washington DC published on April 2000. 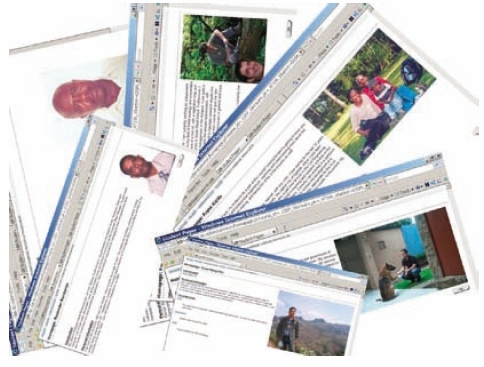 Accessed from http://www2.nea.org/he/abouthe/images/Quality.pdf, accessed on February 4, 2009. Finnie, R. and Usher A. (2005). Measuring the Quality of Post-secondary Education: Concepts, Current Practices and a Strategic Plan. Canadian Policy Research Networks Inc. (CPRN).Research Report W|28, http://www.cprn.com/doc.cfm?doc=1208&l=en, accessed on February 4, 2009. Molendijk, M.A. & Scholten, H.J. (2006). From Local Heroes towards Global Communicators: the Experience of the UNIGIS network in educating GIS Professionals Worldwide. In Nuffic Expert Meeting. Den Haag: NUFFIC. Molendijk, M.A., Scholten, H.J. & Kaandorp, J. (2008). Geographical Information for all: breaking the barriers for GI distance learning. In L. Groenendijk & C. Lemmen (Eds. ), Proceedings FIG International Workshop 2008: Sharing Good Practices: E-learning in Surveying, Geo-information Sciences and Land Administration (pp. 85–100). Enschede: FIG International. Strobl, J. (2008): Digital Earth Brainware. A Framework for Education and Qualification Requirements. In: Schiewe, J. & Michel, U. (Hrsg., 2008): Geoinformatics paves the Highway to Digital Earth. gi-reports@igf, Universität Osnabrück, pp. 134–138. Strobl, J. and A. Car (2009). Continuing Professional Education via Distance Learning – Success Factors and Challenges. FIG International Workshop Vienna 2009 “Navigating the Future of Surveying Education”, Vienna, Austria. The FIG Commission 2 and the Austrian Society for Surveying and Geoinformation (OVG). Nicolas Frunzi delivering his key note speech at the Commission Workshop in Enschede, the Netherlands. The Virtual Campus is ESRI’s e-learning solution, providing a platform for both synchronous and asynchronous online courseware. First launched in July of 1997, for the past 12 years the Virtual Campus has supported an average of 10,000 students per month, totaling over half a million students. In 2001, ESRI partnered with the authors of Geographic Information Systems and Science (GIS&S) to produce a hybrid e-learning course offering, entitled Turning Data into Information Using ArcGIS 8. The course was designed to complement the GIS&S book and reinforce its concepts through exercises and examples. Although the book was no a requirement for course completion, when combined, the two provide a well-rounded pairing of academic and practical instruction. When the book was updated to a second edition in 2004, the course was updated to use ArcGIS 9. Since its introduction, over 5,100 students have taken this e-learning class, and as such, ESRI views the collaboration with the authors as a success, and is dedicated to continuing the relationship with the author team. The course will soon be updated to complement the forthcoming third edition of the book. Additionally in 2001, ESRI decided it was time to offer a synchronous e-learning product, known as Live Training Seminars. A Live Training Seminar (LTS) is one hour of free synchronous content featuring an instructor lecturing with PowerPoint presentations or demonstrations through the Virtual Campus. Interactivity is achieved via a virtual chat, where the students post questions. At intervals throughout the hour, the instructor will answer, via voice, the questions that were posed via chat. An assistant in the room collects the questions for the instructor. Currently, ESRI provides LTSs approximately every six weeks, three times during a given day at 9:00am, 11:00am and 3:00pm PST. There are over 1,200 attendees on average, for each day ESRI offers the sessions. This model uses a streaming media server and the only requirement from the student’s perspective is a Windows Media plug-in on their computer and Virtual Campus access. This model became a quick success and as such ESRI developed a dedicated studio space for LTS production. ESRI also built derivative works from the LTS. A Training Seminar (TS) is an asynchronous version of an LTS. ESRI digitally records each LTS and then selects the best presentation of the three and conducts a small amount of post-processing to clean up the live event. The TS is then uploaded to the Virtual Campus to be consumed by anyone at anytime for free. This model of educational offering has grown beyond being simply a by-product of an LTS. ESRI now creates TSs to teach important topics that do not necessarily need the added value of a live instructor to interact with and answer questions. A second derivative work was the Web Workshop (WW), which were implemented between 2001 and 2005. Web Workshops differed from the LTS and TS by two important characteristics. The Web Workshop was a “for fee” educational offering derived from a TS. In this case, ESRI would create an exercise from a TS using the software to allow the student to not only hear the lecture and see the PowerPoint slides and demos, but to actually download the data and use the software hands-on, to accomplish similar tasks as outlined in the TS. These Web Workshops became very popular and useful in an on-demand learning environment, allowing short focused topics and the ability for the student to actually use the software. Over time ESRI also wanted to produce shorter courses in the original format, so the WW model was eliminated to become one-module courses, removing confusion and simplifying ESRI’s educational offerings. the existing LTS studio and media streaming equipment. Different than the LTS, the ILV offered software exercises. Using a Citrix® virtual environment, students were able to take training without having any impact on their production environments. Importantly, it allowed the instructor to “shadow” the student’s work if they needed assistance, by viewing their progress through Citrix and even taking over the control of the machine as necessary to provide further instruction or assistance. ILVs also introduced phone conferencing in the virtual classrooms, allowing voice, instead of virtual text chat, so the students would have access to speak to each other, the class, and the instructor. 2005 brought the introduction of ESRI’s use of Sharable Content Object Reference Model (SCORM). The SCORM specification is promoted by the US Department of Defense as a standard e-learning specification allowing content to be easily packaged and consumed by different Learning Management Systems (LMS). This ability allows ESRI to take courses out of the Virtual Campus and give them to customers, mostly in the US Federal Government, for consumption in their own LMSs. The biggest lesson learned from this effort was that the SCORM standard was designed under a different educational philosophy than ESRI’s courses. SCORM assumes that you want to have full linear control over the learning experience. SCORM can force learners to visit every page of a course in a specific order before taking a test, then restrict them from revisiting pages or retaking the test. ESRI has a more fluid, non-linear philosophy; less concerned about the order the student visits, or consumes content, as long as they pass the test. ESRI also allows students to take the test as many times as they wish, and re-read the material as often as they like. In 2007, looking to reach another need of on-demand training, ESRI began producing the Instructional Series Podcast as a new e-learning option. These free mp3 files contain approximately 10 minutes of instruction about a single topic with no supporting, i.e. visual, materials. With a minimum of resources, ESRI can produce a new podcast every few weeks using a laptop, the Audacity® recording software and a microphone. Although there is a small amount of post-production, these offerings are very quick and inexpensive to produce. The podcasts have been exceptionally positive with on average over 65,000 downloads per year. Assessing the most successful training on the Virtual Campus, a number of consistent themes emerge. Classes that included “Tips and Tricks” are very popular. This type of training is often seen to fill in the gaps in a student’s knowledge to make them more productive. All topics where ESRI was able to take very technical information and provide it in a simple instructional way were also met with great satisfaction. Classes that had exercises focusing on real-world problems often allowed students to finish the class and immediately apply it to their work or study. Classes that are a comprehensive discussion of a topic, mixed with asynchronous delivery, allowed self-directed learners to consume, absorb, and implement at their own pace, something not seen in synchronous online or in classroom events. Short, just-in-time training options like the LTS, TS, WW, one-module courses, and podcasts are very popular, not only because the majority of these offerings are free. They truly do provide the education that the student needs, when they need it, in a short, focused amount of time, allowing them to get back to their business at hand. Looking holistically at the Virtual Campus, ESRI has also had to acknowledge and address shortcomings. A limitation that ESRI has experienced for a number of years is the inability to offer extensive classes in our server and enterprise-level technologies. This training was provided through LTS, TS, and podcast, but while these methodologies are very useful, ESRI was unable to provide web classes that would allow the student to use the software during exercise scenarios. This was caused by two factors. When taking a web course with exercises, students are allowed to download trial versions of the software to use with the class. Downloading and installation is not an issue with ArcGIS® Desktop, ESRI’s GIS software for desktop and laptop PC’s. Installation of ArcGIS Desktop is as straightforward as installing any PC-based software. Installing a product like Arc-GIS Server on the other hand, required extensive permissions as well as configuration and tuning skills. This added complexity as well as the inability to install ESRI’s exercise datasets into production Server environments has prevented ESRI from providing indepth server and enterprise-level training through e-learning. Third party course authoring has had inconsistent results. Often ESRI works with subject matter experts who are excellent classroom instructors, but have a very difficult time creating materials for asynchronous consumption by students. Another issue was the timeliness of delivery. In all cases, and not unexpectedly, third party authors had other primary means of employment and writing a class for the Virtual Campus was a secondary priority. This often caused issues where course development started using a specific version of ESRI’s software but was not completed until after a new software version release. This often meant a course had to be rewritten or at least updated before it was published, adding to time and costs. Course completion rates have been an ongoing issue. Being that the original course design was asynchronous and lacked much interactivity, averaging 24 or more hours of instruction, course completion rates tended to be below 36%. In many cases there was just too much material to keep the learner continually engaged. Another factor in this statistic was that in academic settings, instructors would select individual modules in different courses as needed to support their curriculum. This is possible since the entire catalog was available to them through the University Site License. This need points to what works very successfully today and the future direction of the Virtual campus: shorter engagements for specific topics. A continuing challenge for ESRI has been the ESRI Course Catalog search feature. As of this writing, there are 216 items in the course catalog, and the search is not very robust. This causes frustration among students in their effort to find what they need. As ESRI shrinks the size of each class, the obvious by-product would be a catalog containing more classes than in the past when the majority of the training on the Virtual Campus was four- or six module courses. This fragmentation of material is very good for the student in an on-demand context, but if they can’t find the training, ESRI is not solving their problem. As a result of this limitation, ESRI has started a project to overhaul and replace how searches are performed on the Virtual Campus, with the intent of making the catalog much easier to navigate. Looking forward, with the success of the ILV model, and more of society being familiar and comfortable with e-learning, ESRI has recently embarked on offering full-day synchronous instruction via the web. After a few technical difficulties, the first test offering was met with complete success and was enjoyed by both the students and the instructor alike. ESRI took the feedback from the event and offered another equally successful event a few weeks later. While the sample size of 38 students is not comprehensive from a statistical sampling prospective, it provided enough data to move forward in this area. ESRI will continue to conservatively expand the program with the objective that it can deliver most, if not all, of the classroom curriculum in a synchronous e-learning context. This will allow ESRI to extend the reach of its current classroom-based instructor-led offerings, by being able to leverage the e-learning platform to deliver synchronous training to a student’s desk, no matter where they are in the world. From a technological prospective, ESRI has moved off of the Citrix Platform for software exercise work and is now using a hosted platform, allowing students to access virtual machines in a hosted environment that have ESRI’s software and course data on them. Taking the experiences that ESRI has learned over the past 12 years, observing the use of the asynchronous and synchronous e-learning on the Virtual Campus, as well as what has been seen in the classroom, ESRI is in the process of completely redesigning how it provides asynchronous e-learning. The intent is to move this training away from the long-used linear learning model with an abundance of supporting material, (i.e., threehour modules,) to a much more on-demand delivery methodology for the entire Virtual Campus, not simply the LTS, TS, and podcasts that are currently offered. Students will be able to access very specific topics when they need to learn about a finite function or task. They can learn a broader collection of topics in any order they choose. Within the classes themselves, there will be a dramatic reduction of text, an (optional) addition of voice, and much more interactivity using Flash and other technologies. This design is not to use technology for technology’s sake or any “wow” factor. It is to allow students to change context to allow them to absorb and retain the material at a better rate. The main force to accomplish this will be the extensive use of exercises, allowing the student to spend more time actively implementing, rather than reading. This modularization and exercise focus is also intended to achieve a long-standing educational goal: the reuse of materials both in an e-learning and classroom context. Since ESRI will now be offering its classroom education on the web, it makes sense to use the same exercise materials for classroom and online training. At a minimum, the target is extensive repurpose, if complete reuse is not an option. Finally, the use of virtual machines and a cloud-based solution will also allows ESRI to teach server and enterprise-based training courses in an e-learning delivery method. Given the current success of podcasts, ESRI’s next advance will be into video podcasting, where, again, students with a portable media player can now not only listen, but view instructional materials. The design will be similar to that of existing podcasts, but extend them into video: 10 minutes of instruction on a specific topic, limited words visually presented, much more voice and demonstration activity. The video podcasts can be accessed in two ways. First, on a computer connected to the Virtual Campus, which allows ESRI to provide a hi-resolution solution for those without bandwidth and screen impedances. Alternatively, students can download the video podcast (in either mpeg or another format) to a portable media player, e.g., Apple’s iPhone®, Microsoft’s Zune®, etc., and consume the material from the device. A future expansion of this type of delivery might also be to cellular devices, allowing ESRI to provide geospatial education to areas in developing nations where there is limited Internet infrastructure, but a robust cellular availability. As previously discussed, discovering smaller educational items in the catalog will be more dependent on search. In addition to improving the existing search feature, ESRI will develop a needs assessment tool wherein a student can enter information about their level of knowledge and what additional knowledge they wish to acquire. The search tool can then lead the student to a collection, or perhaps even a single learning item to satisfy their educational need. In comparison to the age of the World Wide Web, ESRI’s Virtual Campus has been providing geospatial e-learning for a long time. ESRI’s Virtual Campus is an integral component of the future of geospatial education in academia, as well as in business. As such, ESRI continues to keep ahead of new developments in e-learning technologies and pedagogy and intends to continue to evolve the platform to meet the needs of the current and future generations of students and business professionals alike. 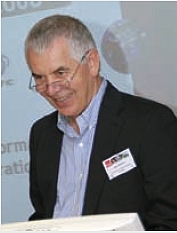 Prof. Bela Markus, FIG Commission 2 chair, at the Symposium in Enschede in 2008. 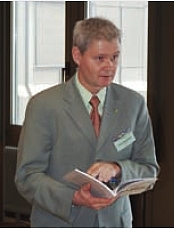 Dr. Reinfried Mansberger at the Symposium in Vienna in 2009. Chair elect FIG Commission 2. FIG Commission 2, Working Group 2.3. 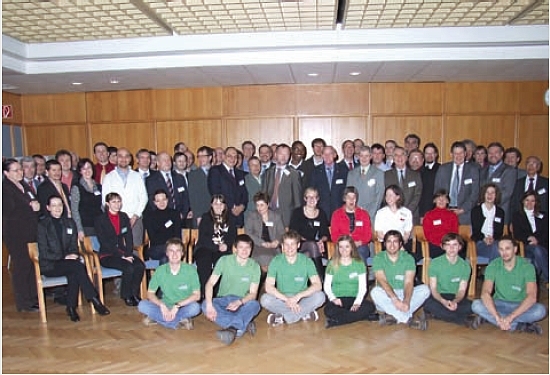 Participants at the Commission 2 Symposium in Vienna in February 2009.